My notes indicate that I had turned the heels on both of them by then (in normal circumstances I've had finished this pair by mid-May and probably a second. I wasn't well.) However, when I picked up knitting again later, I could find only one of the started socks, and the one I had in hand had a problem on one side of the heel flap. 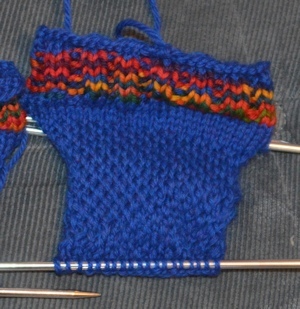 Then I had a lovely Houseguest for awhile at the latter end of June and first days of July, so by the time I gave up looking and decided to start another sock with the same yarn, it was well into July. 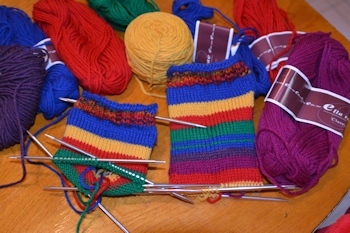 The original plan for the year would have produced two pairs of short socks in May, two pairs in June, and two pairs in July. Didn't happen. The sock on the left was started first, never lost. The sock on the right, started recently, took lead. The apparently "black" stripe is actually a true purple; the purple stripe is magenta-ish. Today, thanks to various things, yesterday's leader stayed in the same place, while the lagging sock zoomed ahead. Thanks to some errors of concentration, the intentionally 5 row stripes were sometimes six (or seven) row stripes, so the lagger not only zoomed ahead, but got out of phase with yesterday's leader. This doesn't bother me at all, as the majority of my striped socks are not perfect matches. 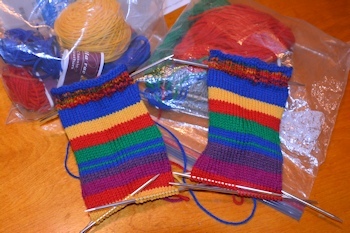 Left sock--stayed same length overnight; Right sock grew. Once I realized I had miscounted a stripe (and was not going to rip out the whole row) I started changing the design a little, and let the purple stripe (really too narrow in #1) go to a full six rows in #2. I am making fewer (but not no) mistakes knitting now--not back up to previous accuracy or speed (same with typing) but good enough to go on with. It's a delight to be able to knit again, even with mistakes. And my feet will be happy with more socks in happy colors. When they're done I'll get them out in daylight and hope for truer color. These pictures were taken indoors in a combination of kitchen light and flash. Aw! Well its good that you're starting again. Hope you feel better. And I love the colours that you've chosen! My grandmother always said perfect meant it wasn't made with love but as work. I'm really glad you are feeling better. Wonderful colours, especially the purple and magenta. So glad you are well enough to knit again. I have finally started my long thought on cable sampler blanket (afgan I think you'd call it) and it's a lot of fun. Like the socks it is knitted in small chunks so I can feel I have achieved something with each square and lots of colours in the blues though purples range with a startling pink to ie a bit of zing. A cable sampler blanket sounds lovely. I need to practice making a cable on something, but something as large as a blanket (even done in squares) is kind of intimidating right now. I figure that if it goes too slowly I can have a cable patchwork cushion, which would apparently be the height of fashion in interior decor; I suppose it's like fashion in clothes, these things all come round again so it's bound to happen that I am in fashion at some point. If the latest square is anything to go by a cushion may be all I make, I just can't keep my mind on this one so keep making mistakes, at least there is never that much of it to unpick. Yes! Those are most decidedly "happy colors". I started smiling the instant that first photo scrolled up on screen and smiled more broadly with photo #2. Those socks should help your feet be happy and tingly warm. When I get through copy edits, I can get back to them. Copy edits are understandably a much higher priority--especially in the dawn of August. Putting it here so I don't lose it and some of you may enjoy it. I'm happy you're back to knitting, I am a non stop knitter and it's great to find out one of my favorite authors is a fellow sock knitter! I just finished the 'Tour de Sock" event on ravelry and did manage to get 4 of the six patterns done on time. Wow! I'm impressed. I started on socks late, but have been pretty steady on them the last few years--unfortunately hitting the Wall put paid to my sock ambitions for this year. We'll see how next year goes.